Is Einstein Wrong? : 13.7: Cosmos And Culture The news of possible faster-than-light particles, Einstein's ideas are again in the spotlight. Although the results are probably premature, they offer a great opportunity to examine how science works, or how it should work. 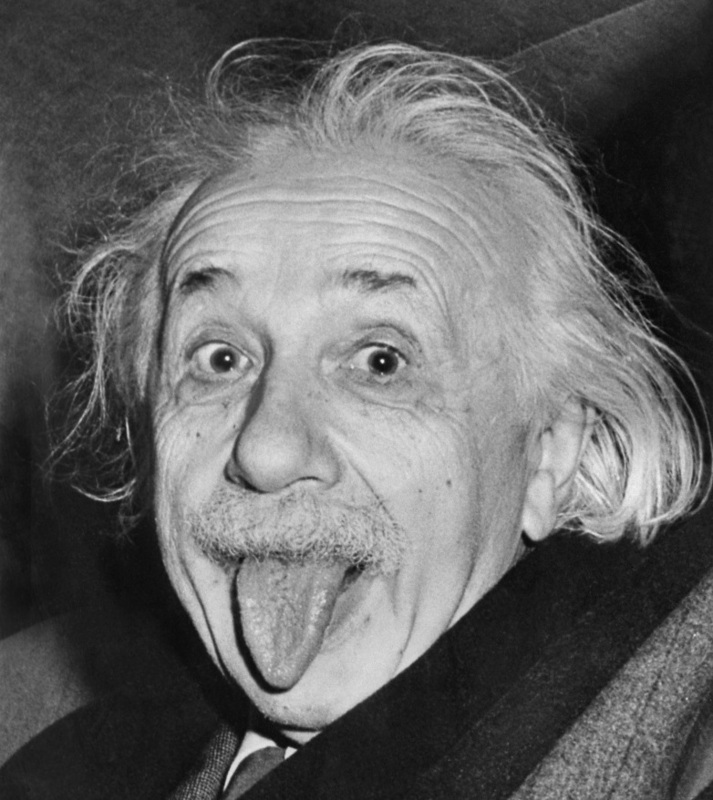 Albert Einstein celebrates his ability to stand the test of time on his 72nd birthday in March 1951. One hundred and six years ago yesterday, the young Albert Einstein, only 26 years-old, had his fourth paper come out in the prestigious German journal Annalen der Physik. The paper was short, only three pages long. But in it, Einstein presented the most famous formula in physics, E=mc2. There is a deep correspondence between energy and mass; and the two are related by the speed of light, the fastest speed in nature. Cut to last week's headlines, reporting that a scientific collaboration between the European Center for Particle Physics (CERN) and the Italian laboratory of high-energy physics at Gran Sasso detected, after three years of data gathering, particles moving faster than light. The culprits are the most elusive of all little bits of matter, the neutrinos, aka the ghost particles. Essentially, the experiments create neutrinos (a specific kind of neutrino called the muon neutrino) at the heart of CERN's large particle accelerator near Geneva. These neutrinos then travel 730 km through Earth's crust until they hit the detectors at Gran Sasso. Although one of the spokespersons for the experiment said that it was as simple as dividing distance by time to get a speed, the details are very complex. In fact, the vast majority of physicists, including this one, seriously doubts that the results will withstand further scrutiny. Although the team of scientists was extremely careful to take into account all possible systematic errors, it's highly probable that something is still eluding them. It could be related to the process that generates the neutrinos, it could be related to timing issues in the detectors, it could related to timing issues in the travel of the electronic signals that will be registered as data points in a computer, it could be related to unknown geological effects. Or, of course, it could be that these neutrinos do beat photons by a few dozen nanoseconds as the fastest particles in nature. But I'm not betting on it. What's interesting to me is the excitement that mounts at every little opportunity that Einstein may be proven wrong. The public seems to want this to happen, as if to confirm that no man can be this smart or infallible. There is even a list of Einstein's 23 "mistakes," most of it very silly and wrong. Occasionally, I receive a document in my office from someone trying (usually without a single equation and with lots of numerology) to convince me that relativity is wrong and that their theory of the world is the right one. Unfortunately, it's all mostly nonsense. It takes at least a decade of very hard work to become a research theoretical physicist. It involves diving into some serious math. Just as you need notes to make music, you need math to make physics. Formulas are representations of natural phenomena and have immense descriptive and predictive power. E=mc2 is a prime example. From a scientific perspective, be it Einstein or anyone else, it is our job to test and retest theories, hunt for their weak spots and expose them. For it is from the cracks of old theories that new ones are born. Given the depth of most of Einstein's remarkable contributions to physics, finding a crack in any one of his theories would possibly lead to new revolutions in our understanding of nature. But there is nothing sadistic here; quite the opposite, the skepticism is very healthy. As I wrote before, science needs to fail to advance. But faster-than-light-neutrinos are probably not it. In retrospect, there have been several instances where one or the other of Einstein's ideas have been challenged. Given their often outrageous nature, that's not a bit surprising. After all, from the quartet of 1905 papers came the notion that light can be understood not just as a wave but as a particle, the photon; that space and time are not absolute, only the speed of light is; that mass carries immense amounts of energy; that molecules were real and not figments of the imagination. All of these were despised, doubted, tested, and finally accepted, against strong resistance. What makes science work is precisely its immunity against long-term prejudice. If an idea is right, sooner or later it will find the limelight. And, back to Einstein, in many cases ideas take time to mature and, only after a few tries, the scientist gets it right. This was the case with his general theory of relativity, the one that says matter and energy can bend space and influence the flow of time. Does this make the formative steps toward the final version of the theory—developed between 1907 and 1915—mistakes and Einstein "wrong"? Absolutely not! Usually, if an idea or theory is wrong, it is quickly abandoned. There may be a couple out there, but as far as I know, all of Einstein's main results are still with us, inspiring further research. This is similar to what happened to Newton and his new theories of motion and gravitation, published in 1686. For 200 years they inspired a revolution in our understanding of nature, including Einstein's work. Was Newton "wrong" after Einstein corrected his theories? Absolutely not! Theories must be understood within their limits of validity; they are all "wrong" if applied beyond their stated boundaries. Einstein himself called one of his ideas, the addition of the so-called cosmological constant to his equations describing the universe, his "biggest blunder." In 1931, when he visited Edwin Hubble at the Mount Wilson observatory and saw for himself the redshift of distant galaxies, he realized that the expanding universe, a notion he had resisted, was here to stay. As it turns out, in a 1917 paper he had added the extra constant to insure that the universe would be static. With Hubble's results, he saw no need for the term anymore. And yet, here we are, contemplating the possibility that the cosmological constant is the mysterious "dark energy" responsible for accelerating the universe. The lesson here is simple: beware of quick, euphoric responses to preliminary scientific results, especially those that take aim at well-established theories. Although we must question to advance, we must also be careful before we blow the trumpets announcing the upcoming revolution.